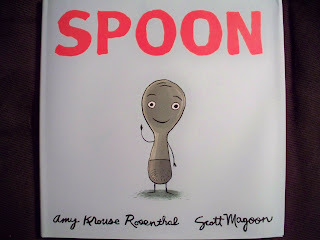 This children's tale begins with Spoon being envious of the jobs and abilities of other pieces of silverware. In the end Spoon might just realize what a good job and life he has. The uses of common utensils is discussed along the way. Amy Krouse Rosenthal mixes this educational thread with the moral lesson. The wording and flow are wonderful. It is an entertaining read for all ages. The illustrations compliment nicely. Overall a great new book that the whole family can enjoy and be able to take away a renewed sense of self.